Galvanized Iron Security Folding Gates. Secure Your Warehouse Bay Doors With High Quality Galvanized Iron Seucity Gates To Prevent Intruders From Entry To Restricted Areas While Protecting Worker Safety. Folding gates offer optimum level of security against threats. 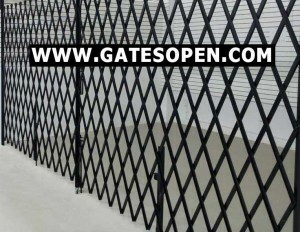 Now days folding security gates are made of high quality galvanized steel gates that have the potential to protect your business or home form. Scissor style gates maintain proper ventilation by allowing outside air and light to pass through. Gates are manufactured with galvanized heavy duty steel that can stand up to any intruders and anything Mother Nature can hand out. Can be folded within small dimensions. If you cannot find what your looking for please call our security gate experts to receive a FREE QUOTE. All gates are manufactured 100% in the USA. We also can build you a custom made security gates to meet your specifications.